Teaching artist, project leader, project supporters, students, teachers. 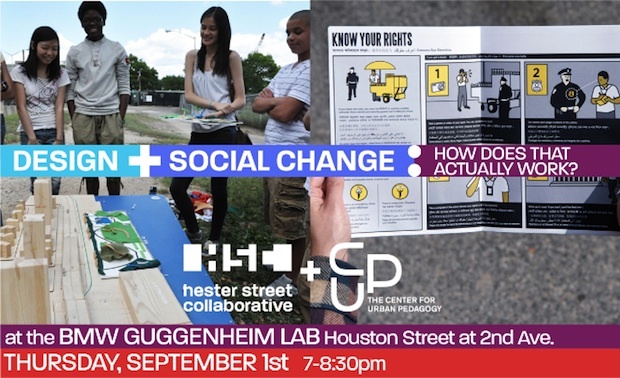 Through the collaboration of art and design professionals, educators, community-based advocates and policymakers, this non-profit organization takes on complex policy issuesâ€”from the juvenile justice system to zoning law to food accessâ€”and breaks them down into simple, accessible, visual explanations. They develop documentaries, posters, and publications, as well as workshops, and other teaching tools that they use in community education programs. CUP also partners with schools and afterschool programs to produce experiential,project-based curricula. To improve civic engagement in the shaping of public policy. "We believe that increasing understanding of how these systems work is the first step to better and more diverse community participation". Audiences include community organizations, who use the products in their own organizing efforts; educators, who use the products in their classrooms; and other constituencies addressed in particular projects, such as New York City street vendors or residents of public housing. Their education programs vary in length from one day to one semester and reach over 500 students each year â€“ from the Bronx to South Brooklyn and everywhere in between.